Background The use of STOPP–START criteria during hospitalization reduced inappropriate medications in randomized controlled trials. Objective To evaluate whether the implementation of a screening tool (short version of STOPP–START criteria) in routine geriatric practice reduces potentially inappropriate medications (PIM) and potential prescribing omissions (PPO) at discharge. Methods We conducted a retrospective interrupted time series analysis. Four periods were selected between February and September 2013: (1) baseline situation; (2) screening tool made available to physicians; (3) 3 months later; (4) weekly meetings with junior doctors and a clinical pharmacist to review treatments according to the tool. The primary outcome was the proportion of patients with prescribing improvement from admission to discharge. Results We included 120 patients (median age 85 years). The prevalence of PIMs and PPOs on admission was 56% (67/120) and 51% (61/120) respectively. 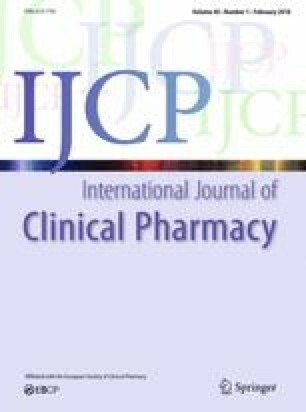 Hospitalization improved prescribing appropriateness in 49% of patients with PIMs (33/67) and 39% of patients with PPOs (24/61). The use of the screening tool by way of multidisciplinary meetings was a predictor of PIMs reduction at discharge. Conclusions The sole distribution of a screening tool in a geriatric unit did not reduce PIMs and PPOs. Multidisciplinary meetings to review treatments should be encouraged. The online version of this article ( https://doi.org/10.1007/s11096-017-0563-y) contains supplementary material, which is available to authorized users.